Some companies claims that they have new way to block malicious traffic but they arent always reliable and accurate most recent example is this. For wordpress there is a plugin called “Bad Behavior”. Welcome to a whole new way of keeping your blog, forum, guestbook, wiki or content management system free of link spam. 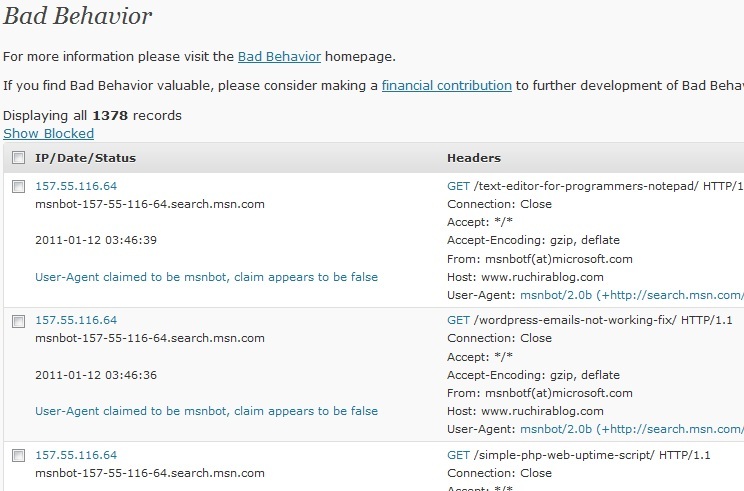 Bad Behavior is a PHP-based solution for blocking link spam and the robots which deliver it. Seems interesting right? I mean simple solution like installing plugin to filter bad traffic? Yes I thought that too and went ahead installed it and ran it for about a month. But I didnt bothered to check the log recently. And I did today and found out that its blocking some legitimate bots like Amazon,MSN (Bing) bots. So as the log it blocked MSN bot for about 1000 times. And I checked the wordpress forum about bad behavior plugin and found that some users complained that its blocking google bot too. So think twice if you want to use this plugin! Contact forms without captcha doesn’t seem to be good idea! Track online users live in your wordpress blog! Same thing… Bad behavior blocks googlebot for my blog. Traffic from google fall down more than 5 times in two weeks. Actually Pretty much everything blocked by BB was legit bots (even on softer settings). I disabled it and left only akismet deal with spam. When traffic and spam gets more intensive I’ll look into something like Spam Free WordPress … or anything which may work like BB … without the blocking of legit bots and valid visitors. I’d appreciate suggestions actually. I was using the WP BB plugin to help block spam until I noticed the exact same thing. I had been wondering why I wasn’t doing so well on Bing and then I found out, Bing couldn’t even crawl my site! I’m now using Cloudflare which helps with the spam and speeds it up at the same time. Plus I’m now doing OK in Bing so it’s all good. hi Ruchira, could you recomend another plugin to filter bad traffic? Thanks in advance! what kind of bad traffic? I lost 90% of my Google index since I used Bad Behavior plugin on my blog.It blocked googlebot for my blog (saw 945 errors in webmaster tools account).Now i’m still trying to solve the problem. Solution is simple get rid of the plugin. Its rubbish. I cannot access my ownsite. I believe Bad Behaivour is preventing me from login to it. So, can I just delete the plugin from root at my hosting? Very strange: I use Bad Behaviour for years and 80% of my traffic (about 300 visitors each day) comes from Google search and my posts are well indexed. About the problem and it’s correction. Previous post: Fake news can really drive traffic!